In order to realize these, JDREA members have been continuously developing advanced technologies through acquired extensive and nurturing experiences in marine civil engineering field, such as port and harbor facilities and offshore airport structures. JDREA also aims to create a prosperous society by promoting marine civil engineering projects through research and development of advance engineering and construction techniques, contractual approach, safe work, disaster prevention, environmental conservation and international cooperation for development. In addition, JDREA takes part in activities as a member of Japan branch of The World Association for Waterborne Transport Infrastructure (PIANC) and The International Association of Ports and Harbors (IAPH). Representative,Chief Executive Officer & Representative Director of PENTA-OCEAN CONStrUCTION CO., Ltd.
Representative Director & Chairman of TOYO CONStrUCTION CO., Ltd.
AOMI CONStrUCTION CO., Ltd. OHMOTO GUMI CO., Ltd.
KABUKI CONStrUCTION CO., Ltd. PENTA-OCEAN CONStrUCTION CO., Ltd.
HONMA CORPORATION MIRAI CONStrUCTION CO., Ltd.
RINKAI NISSAN CONStrUCTION CO., Ltd. WAKACHIKU CONStrUCTION CO., Ltd.
AOKI MARINE CO., Ltd. ASAKAWAGUMI CO., Ltd.
PENTA-OCEAN DREDGING CO., Ltd. KOJIMAGUMI CO., Ltd.
SHINKO CORPORATION DAIOH-SHINYO CONStrUCTION CO., Ltd.
TOMAC CORPORATION NIKKI CONStrUCTION CO., Ltd.
NIPPON KAIKO CO., Ltd. YAMATO KOGYO CO., Ltd.
YOSHIDA-GUMI COPORATION. 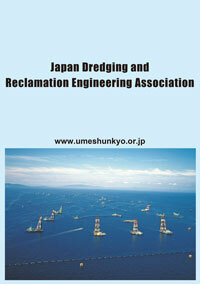 YORIGAMI MARITIME CONStrUCTION CO., Ltd.